Good Thursday morning! The week is half over and I'm so behind!!! I have 14 million things going on in my life (all because I "lite" too many fires) and I can't see the end of the tunnel. Why do I do this to myself??? ANSWER: because I'm a "nut case"! I just have to stay busy ... ha!!! That's an understatement for me! However, I'm making a list - and checking things off... just like SANTA!! Coming up in a few days is a wonderful traditional rug hooking retreat that I attend here in Jacksonville. My friend (Katie) and her mom (Judy) are the sponsors - here at Embassy Suites on Baymeadows Rd. So.. I'm trying to get all of my equipment, projects, etc. in a giant pile for that event. My instructor - Diane Kelly - loves primitive hooking so I'm in luck. She will be helping me with my new design - a large wool hooked bag! On one side is a FOX and on the other side is a HARE. I've started the fox but now I need her expertise in working on the HARE. This bag will be awesome when finished (when that will be... God only knows!). It will turn heads when I walk in a room with it. (that's what Katie told me). So... I'll try to take some pictures at the retreat and show you my progress! Look at this funny dog!!! I thought this was a pretty great "happy" picture for the middle of January... especially for all of you that have snow in your area! Isn't this a hoot? 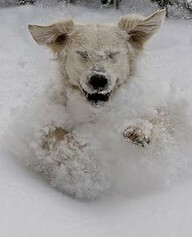 He's having a blast! That's what life is all about - having a GOOD TIME! Remember how we talked in earlier postings about collecting things? Well... 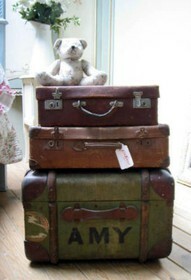 I don't have many of these - but they are a passion.... Look at the collection of these awesome suitcases !!! Don't you wish "things" could talk and tell their history? Just think how many more zillion history books we would have in the world. 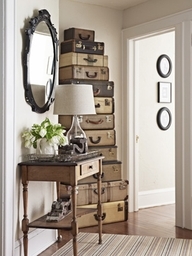 Suitcases... let me tell you a story about the kind in this picture. Years ago we (Vicky, Heather, and I) had this bright idea to collect these cool cases from the antique shops. They were all very reasonably priced - we could pack them with all of our fabric, kits, etc. and haul them to our quilt shows. Then we could use them in our displays! When we would unload our van(s) and pile all of these up on our dollies and head into the convention center - EVERYONE would look at us! I wish I had a dollar for every time someone said something to us about how "cool" they were... and how many times people wanted to buy them! NO.... DO NOT TOUCH OUR SUITCASES!! ha! To this day... I still look for them in antique stores and they are almost extinct. Every decorator in the world has snatched them up. I still have several from the store that I use in the house and I still LOVE THEM!! 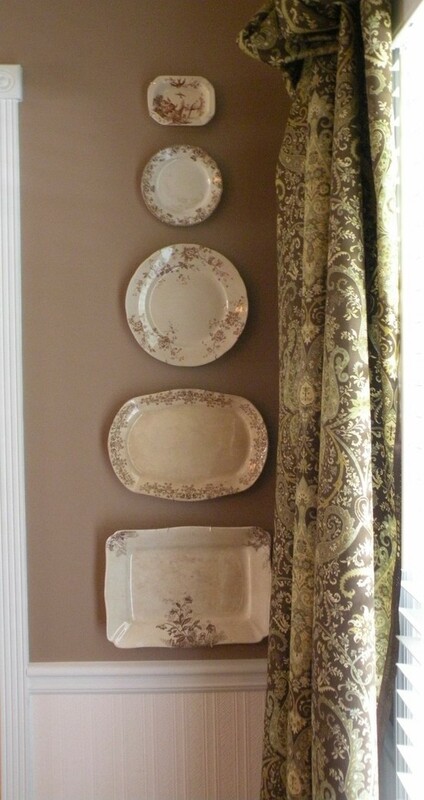 Here's another decorating tip that I love! 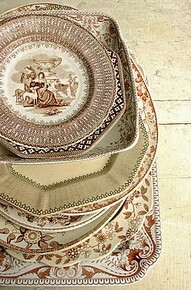 Brown and BLUE transfer ware are simply gorgeous. 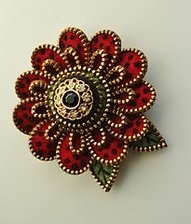 You can find them in antique stores... then - once you have a nice collection, look what you can do with them! Now how pretty is this? Antique brown transfer ware on a tan wall - that compliment the drapery. I think it's stunning. I have blue transfer ware on the walls in my sewing room! White ironstone pieces in my kitchen. It's an inexpensive way to decorate and looks lovely! PLUS... it's just SO FUN to collect. I was clicking on Pinterest the other day (heck... I do it every day... 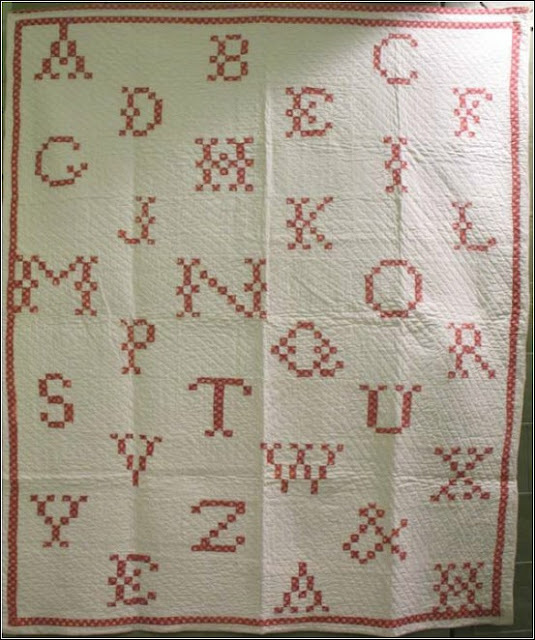 MANY TIMES) and I found this antique quilt that I have always wanted to make. So... I'm drafting each of the blocks on EQ (Electric Quilt software). Once I have all of the blocks finished- this sweet thing will be purring on my sewing machine. I'm adding my initials in the corner and the year. Don't you just love it? Then... look what else I found !!! These are so pretty and I MUST look into how they are constructed (it's on the "to do" list... that is getting HUGE). They are made from zippers! What do you think? Wasn't I right... cool huh??? Such talent - people and their artistic skills just amaze my brain! Then... in keeping with the idea of "organizing" I saw this clever trick to help keep your cupboards a little more manageable! It's simple tension curtain rods. I thought this was brilliant and was pouting because once again.. I feel ignorant that I couldn't have thought of this brilliant idea. 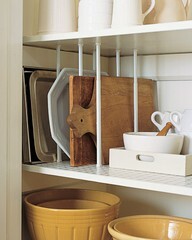 It can work in any storage area that you have ... in the kitchen, linen closet, garage, pantry. Heck...there may be a MAD run on small tension rods at your local Walmart or Target! Watch out! YUM for the day!!! Isn't this cute? I'm making these for my February "treat" for the B-a-a-a-d Girls Club at Cinnamon's Quilt Shoppe! 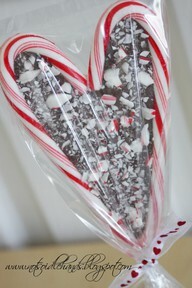 Fudge melted in between candy canes and then put on a stick! I can't wait to make them. What a fun treat!! Then............. HAVE FUN TODAY! Get outside and breath the fresh crisp air!